Washington (CNN) – Former President George H.W. Bush and his wife Barbara are giving their grandson's political ambitions a big boost by hosting a Wednesday evening fundraiser for George P. Bush, who is running as a Republican for the post of Texas Land Commissioner, CNN has learned. The event, to be held at the former president's home in Houston, is also featuring former Florida Gov. Jeb Bush, George P.'s father, according to a source with knowledge of it. About 50 people are expected to attend with each paying $10,000. This is the first fundraiser by the grandparents and his father for George P. although Jeb Bush has done other events promoting his son's candidacy. 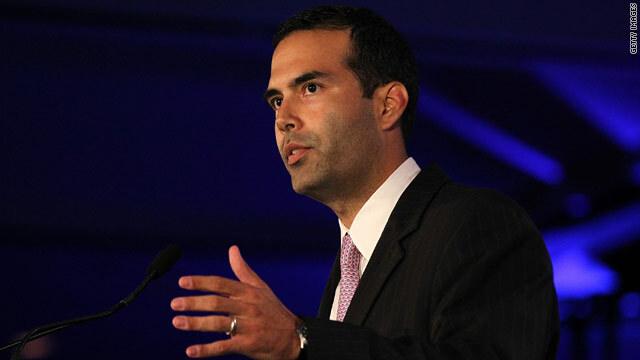 While so far he has no primary opponent, George P. Bush is making sure he has a large campaign war chest in his inaugural political campaign. He will headline a major fundraiser in Washington, D.C. next week. His campaign has already held dozens of other fundraisers in Texas as well as some in Florida, where he grew up. While discussing whether his brother Jeb will run for the presidency in 2016, former President George W. Bush touted his nephew's candidacy in several interviews last week at the opening of his presidential library. "I do know his son, George P., has made up his mind, and he's running for general land commission in Texas, very important position. And I think he'll do very well if given the chance to serve," George W. Bush told CNN's John King last week. Running for office for the first time, George P. Bush has already drawn a lot of attention in political circles both in Texas and nationwide. He previously worked to help improve the Republican Party's outreach to Hispanic voters as well as founding MAVPAC, a political action committee composed of young professionals. Is it even possible that a Bush finds employment in the private sector? Just curious. Royalty without a doubt ! Preston Bush was an aid financially to Hitler. Look it up. Another big boost from corporate America to purchase another Bush. Oh great! As if we need another Bush! Bush ruined this nation–now GOP thugs. He's got the shifty, darting eyes and the five-o'clock shadow of a young Richard Nixon. Just has to get the scowl right. The Republican party is an unfit party to rule so George P my advise to you run as a democrat and maybe i will vote for you.